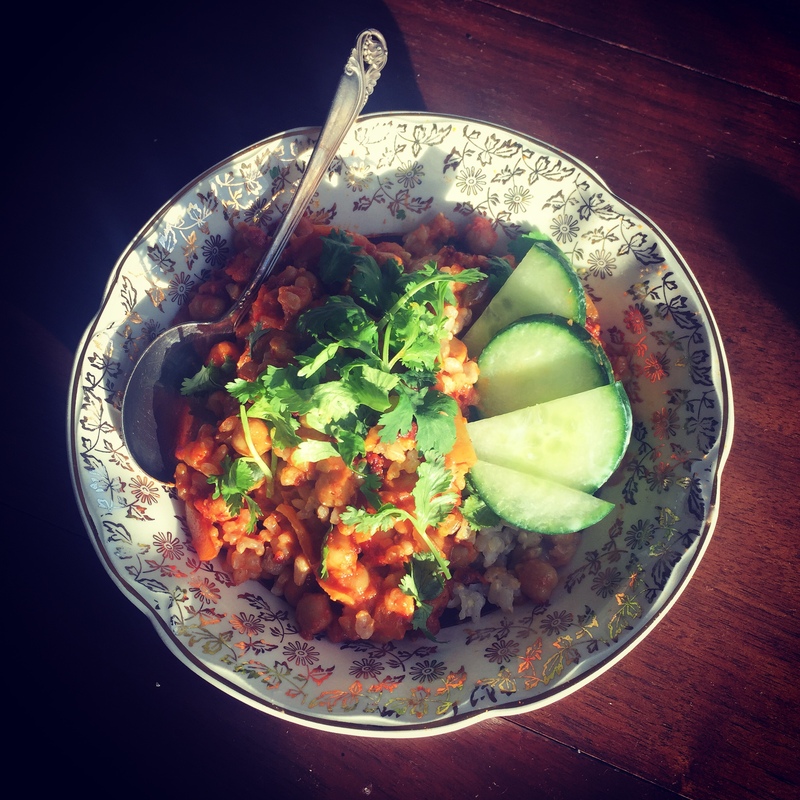 This recipe was created by Leena, and she thought it was so easy and delicious that it might be worth sharing with the QSY community! This dish is very allergy friendly, which makes it great for potlucks… It’s vegetarian, dairy free, gluten free, nut free, but still super delicious! *My preference is to purchase whole seeds of these spices, and grind them together in a spice grinder. You can also purchase them pre-ground, but the flavor isn’t as fresh. **Whenever possible it’s best for your digestion and your budget to soak dry legumes and pre-cook them ahead of time. You can even make a big batch and store them in jars in the freezer to save time. Pre-soaked and home cooked beans are far more digestible than the canned ones- no Bean-o necessary! This recipe can be made start to finish in one pot, or you can sauté the onions and spices in a pan, and then transfer them along with all other ingredients into a crockpot and slow cook it on low for 3-5 hours to really let the flavors meld. Start by dicing both onions. Melt the oil, ghee or butter in a heavy bottomed pot on medium heat and add diced onions. Meanwhile, grind and prepare your spices. Add spices to the onions and continue to sauté until the onions become somewhat translucent. Add all remaining ingredients to the pot and bring to a slow simmer. You can serve it once it’s hot if you’re in a hurry, or leave it to simmer on low heat, or slow cook it to allow more time for the flavors to meld and become more richer. I like to serve this curry over brown rice with a side of sliced cucumber and cilantro. Hope you enjoy. Let us know how it goes!